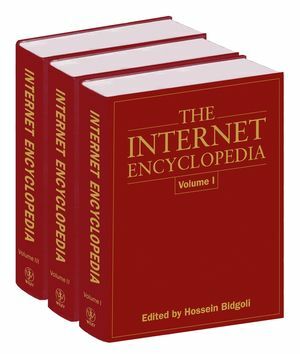 The definitive, three-volume Internet Encyclopedia covers every aspect of the Internet for professionals. This up-to-date compendium offers a broad perspective on the Internet as a business tool, an IT platform, and a medium for communications and commerce. It presents leading-edge theory and recent developments as described by global experts from such prestigious institutions as Stanford University and Harvard University, and such leading corporations as Microsoft and Sun Microsystems. Available in print or in subscription-based online format, it's the only resource that offers complete, up-to-the-moment coverage of fast-moving Internet technology. Editor: Hossein Bidgoli is a tenured professor at California State University Bakersfield in the Management Information System department within the school of Business. Professor Bidgoli is a two-time winner of Meritorious Performance and Professional Promise Award for 1985-86 and 1988-89, School of Business and Public Administration, California State University, Bakersfield, these awards were granted based upon outstanding performance in teaching, research and school/community service. Professor Bidgoli is also the recipient of the outstanding professor (professor of the year) award for 2001-2002. Professor Bidgoli is the author or editor of 41 books, numerous peer-reviewed articles and a trainer and consultant. Professor Bidgoli lives in Bakersfield with his wife and two children.